NC DNA Day » SEE THE RAINBOW? When I was young, there was this one kid in my class who had all the colors of crayons. The rest of us would have the basics, but she had a pack of 256, with colors like “burnt umber” and “razzmatazz”. The rest of us would ooh and aah and beg to borrow them. Well, most of the rest of us. There was one little boy who didn’t get what all the fuss was about. He couldn’t tell the difference between blush and carmine when we waved them in his face. Mostly he escaped the fray and colored green dogs. This little boy, like up to 8% of all male-bodied individuals and 0.5% of female-bodied individuals, was color blind, a condition in which someone cannot see one or more colors properly. To see colors, receptors in our eyes called cones respond to certain wavelengths of light, sending a signal to the brain when they are activated. Humans have trichromatic vision, meaning we see three colors: red, green, and blue. Any other colors we see are combinations of these. In color blindness, one or more of these cones is mutated, so it responds to light inefficiently or not at all. 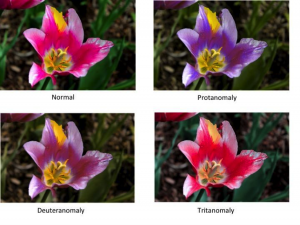 Protanomaly and deuteranomaly are both commonly referred to as “red-green color blindness”, but this is a misnomer: in each case, a person is only deficient in seeing one color, and not both. 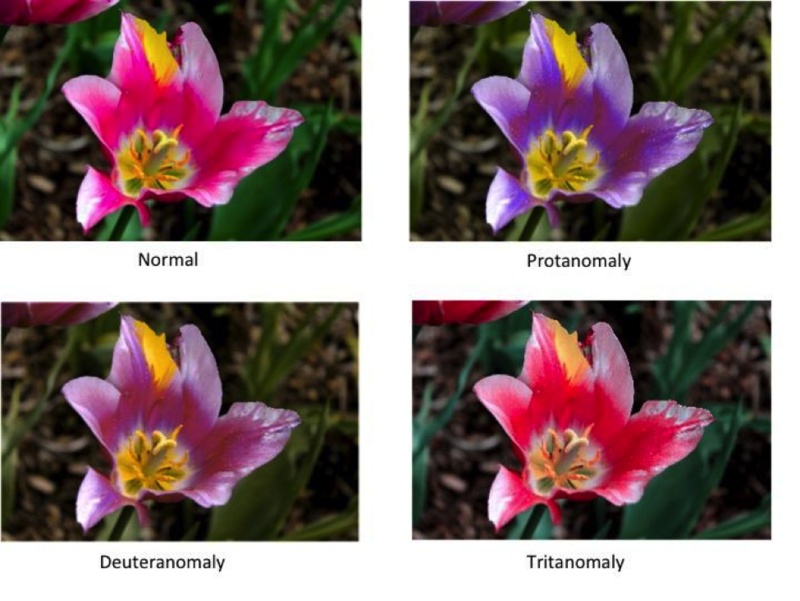 Tritanomaly is much rarer, but is called “blue-yellow color blindness”. Color blindness varies in severity, and is more correctly called color deficiency. When someone has a mutated rod, they might be able to see a bright hue of a certain color, or they might see some components of a color. 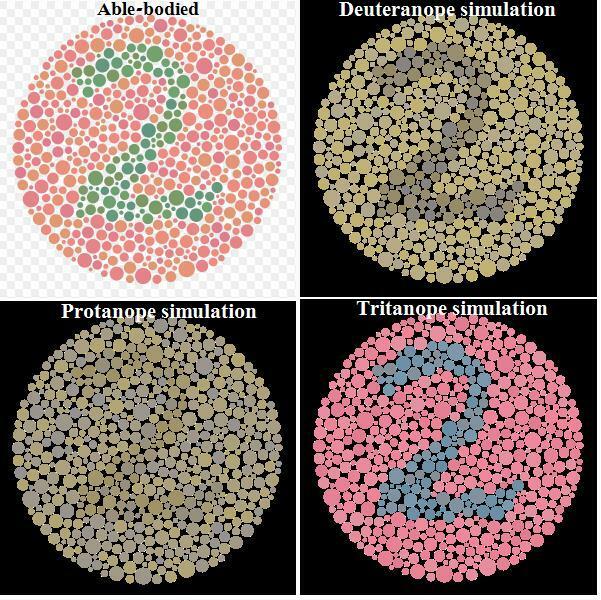 To get an idea how the world looks to someone who is color blind, check out the figure below and this Vision Simulator. Image of a flower as it would appear to someone with normal vision (top left), a mutated red cone (top right), a mutated green cone (lower left), and a mutated blue cone (lower right). Original image courtesy of Kristina Schiller. Image process with Coblis. Color blindness is a recessive genetic disorder. Humans have 23 pairs of chromosomes, each with copies of the same gene. In some cases, one copy of a gene will be mutated, so the protein made from the gene won’t work. However, if the copy of the gene on the paired chromosome is functional, a working protein can be made. If both copies of the gene are mutated, no working protein is made, and a person has a genetic disorder. Both protanomaly and deuteranomaly are also X-linked disorders. Female-bodied individuals have two X chromosomes, so they follow the usual rule of recessive disorders. Male-bodied individuals have only one X chromosome, so if a gene on that chromosome codes for a non-functional protein, there is no chance of a corresponding functional copy from another chromosome. This is why male-bodied individuals are far more likely to be deficient in red or green color vision. 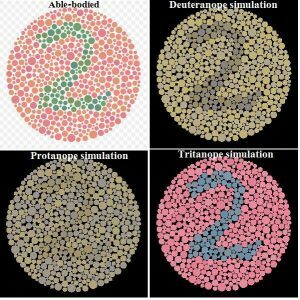 There are several tests for color blindness. The most common one for red and green color deficiency is the Ishihara Color Test. It consists of a circle, or “plate”, made of differently colored dots of different sizes. The dots are different shades and come from two separate color families, with dots in the foreground forming a number that someone with normal color vision can read. Some plates have less contrast between the colors. See the figure below for an example of this test. This is an example of an Ishihara test. In the upper left corner is what someone with normal color vision would see: green dots form the number “2” on a pink and orange background. The other corners show what people with a total impairment in one rod would see: in the upper right, the green rod is impaired (deuteranopia); the lower left, the red rod (protanopia); and the lower right, the blue rod (tritanopia). Although color blindness does not necessarily make a huge impact on someone’s life, it can create difficulties when watching a presentation, viewing a webpage, or reading a graph. If you create any of those things, you might want to read about designing color blind-friendly visualizations. For an absurdist take on a dystopian world in which everyone experiences some form of colorblindness, check out Jasper Fforde’s Shades of Grey.